Washington (AFP) - The US Justice Department official who once oversaw the Russia probe, Rod Rosenstein, plans to resign in mid-March, US news outlets reported. Rosenstein's departure from his post as deputy attorney general has been expected for some time. CNN late Monday quoted a department official as saying it has nothing to do with recent explosive claims by the former acting director of the FBI, Andrew McCabe. McCabe has said that Rosenstein raised the idea of wearing a wire to tape President Donald Trump and talked about removing him from office under the 25th Amendment after Trump fired FBI director James Comey in May 2017. 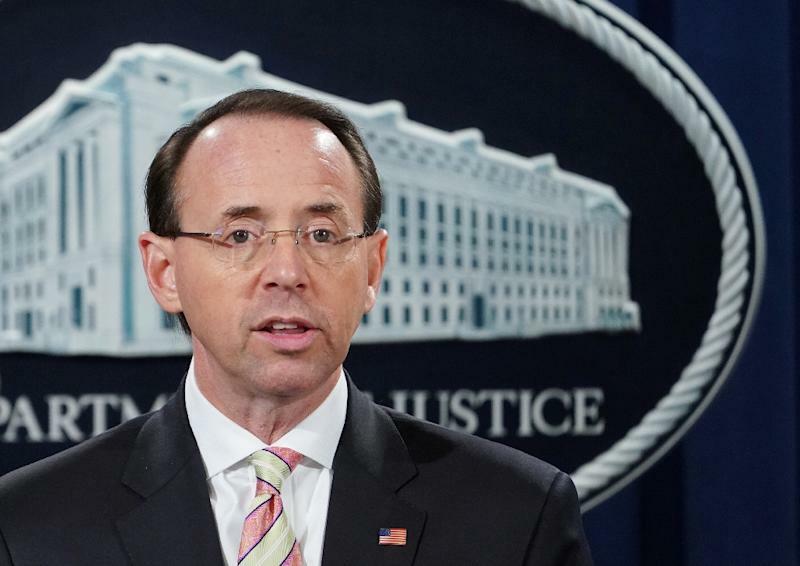 CNN said Rosenstein has widely been expected to leave his job after Bill Barr is confirmed to fill the vacant post of attorney general. The network said that a departure by Rosenstein next month could suggest the Russia probe being carried out by special counsel Robert Mueller is nearing completion. Trump abruptly fired Comey as pressure rose over the Russia investigation, setting off alarm bells in the FBI and Justice Department. According to McCabe, in a lengthy interview that aired Sunday on CBS's "60 Minutes," Rosenstein brought up the possibility of invoking the 25th Amendment of the US Constitution, which provides for the removal of a sitting president for incapacity. "Rod raised the issue and discussed it with me in the context of thinking about how many other cabinet officials might support such an effort," said McCabe, who has a book coming out, "The Threat." The deputy attorney general, who remains in office but no longer supervises the Russia investigation, appears never to have acted on those ideas.